It would be great if we had the possibility to input applications/windows addresses into a list, in order to not having auto-placement activated. Very good software, but there are some bugs. When ALT + CTRL is the keyboard shortcuts modifiers inside shorcuts, we can’t type some letters with the french keyboard. This topic was modified 1 year, 7 months ago by ovnis81. – Could you please be more specific about the display issue during resizing? 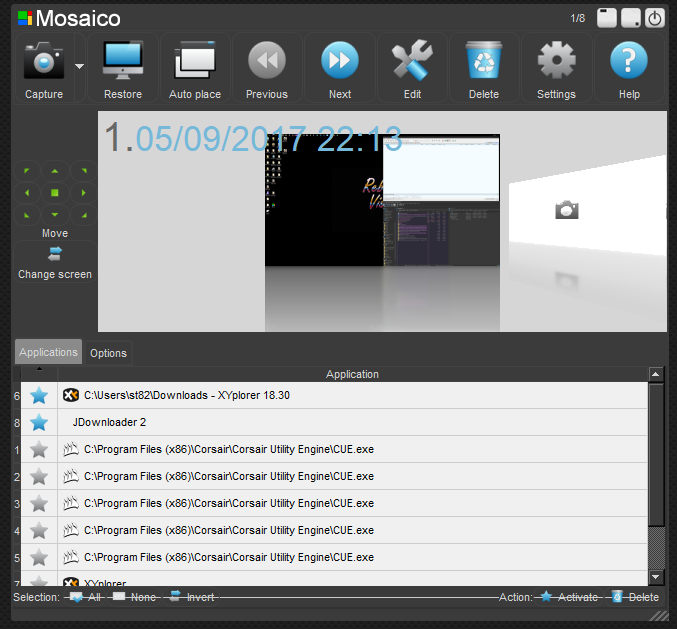 – Mosaico does its best to try to work with all apps, however some of them have a custom handling of their resizing functions, and will not allow external apps (i.e. Mosaico) to resize them. You can improve this by running Mosaico with admin privileges. Thank you anyways for reporting this, I’ll try to improve compatibility with these apps, if possible. At the bottom there is a bar. I don’t know if it’s a Mosaico issue, but sometimes when i reset my computer, when i open Firefox, it sites at his previous emplacement but there is a little space at his left edge. Ok thanks, I didn’t spot it the first time. That could be a refresh problem, I’m going to investigate in the code and try to fix it. when i reset my computer, when i open Firefox, it sites at his previous emplacement but there is a little space at his left edge. Are you restoring Firefox through Mosaico or just launching it normally? There are some issues when we make manipulation inside some softwares (without move any title bar). Auto place window turns on ! Plus, tt would be great to have the possibility to disable auto place for some software which have internals windows (like audio sequenceur). This reply was modified 1 year, 5 months ago by ovnis81. Plus, it would be great to have the possibility to disable auto place for some software. It can be usefuel for somes software which have internals windows (like audio sequenceur) or for softwares we don’t want to snap. When auto windows is enabled, there is a keyboard shortcut to avoid auto windows when we move a window ? Hi! When auto placement is enabled you can’t disable it on the fly, nor disable it for a specific app. I’m adding these features to the backlog and I hope to have them implemented soon. You can however disable auto placement and enable it on the fly by holding CTRL+ALT while dragging any windows.